What you've not noticed about the yield curve. 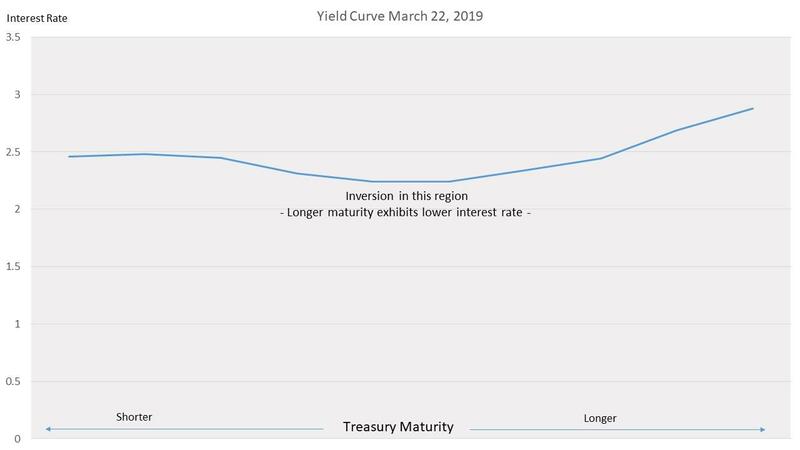 On March 22nd of this year, financial news outlets reported the first yield curve inversion since 2007 (see chart below). A yield curve represents interest rates, at a point in time, across treasury securities of varying maturities. A normal curve slopes consistently upward (higher interest rate) as the maturity of the security is longer. An inversion occurs when a shorter-term security has a higher interest rate than a longer term one - the curve slopes downward. The recent inversion came courtesy of the spread between 3-month TBills and 10-year TNotes (3M/10Y). Interest rates on 3-month TBills exceeded those of 10-year TNotes. Interest rate pairs, like the one noted earlier, reveal inversions in the yield curve. Analysts conclude that these inversions are the first reliable signal of an economic recession and a rate-cutting cycle. Yields are normally higher on longer-term securities due to interest rate unpredictability over the extended time horizon and the time value of money. It is often assumed that longer-term securities reflect lower interest rates when economic activity is expected to weaken. The yield curve slopes upward during economic expansions and inverts or slopes down in anticipation of an economic slowdown. Lower interest rates are presumed to allow private enterprises to acquire capital at reduced costs and thus stimulate a weak economy. The aforementioned represents the corpus of conventional wisdom. Long-term interest rates (10-year and 30-year) made their lows in the summer of 2016 after trending down since 2007. Rates on 3-month treasuries began their upward trek in early 2016 after hovering around 0% for nearly 7 years. By this logic, the economy needed at least 7 years of stimulation and is now in the throes of a significant expansion due to increasing rates. But our opening paragraph suggested economic weakness. It's also evident that lower interest rates stimulated stock repurchases perhaps more than anything. The vertical axis represents the interest rate difference (in basis points) between the longer-term security and the shorter-term one. For the 3M/10Y line, it's the interest rate on the 10Y minus the 3M times 100. Under normal conditions, this number is greater than zero. The yield curve is declared inverted when one of the interest rate pairs has a value less than zero. After being inverted from mid-2006 until mid-2007, the yield curve began its upward slope - the interest rate pairs went from values less than zero to greater than zero. Notice when 3M and 10Y interest rates made their highs. For the second half of 2007, the economy experienced falling interest rates, widening interest rate spreads, and a rising yield curve. The recession officially began in November of that year. We know what happened in 2008 when the economy contracted. The interest rate spreads (3M/10Y) and (2s/10s) continued to widen and the yield curve maintained its upward slope, which, according to conventional wisdom, suggested an expanding economy. The story might have ended there except for massive government intervention and the central bank Wizards starting Quantitative Easing Round 1 (QE 1). QE 1, noted in the chart below, was a massive purchase of assets by the Fed, which included government bonds and other financial assets like mortgage-backed securities. Since the Fed follows the market's interest rates, they felt compelled to intervene through direct security purchases in an attempt to further depress longer-term rates. History will debate the efficacy of this move, though, as I've noted in another article, the Fed ushered in the "omnibubble." After QE 1, interest rates continued moving down and interest rate spreads narrowed. Both short-term and long-term rates continued to move in the direction already established by the market before the Fed initiated QE 1. There were two more rounds of Quantitative Easing officially ending in October 2014. Though the Fed ended its asset purchases, its balance sheet remained in the $4.5 trillion neighborhood. How, you ask? The Fed simply rolled over existing debt when maturing. It wasn't until early in 2018, when the Fed executed Quantitative Tightening (QT), that its balance sheet began to contract. Short-term and long-term rates, which had already been on the increase, continued along this path until late 2018. The yield curve detail you've probably never heard of is one that piqued interest during my purchases of short-term treasuries (6 months and less). 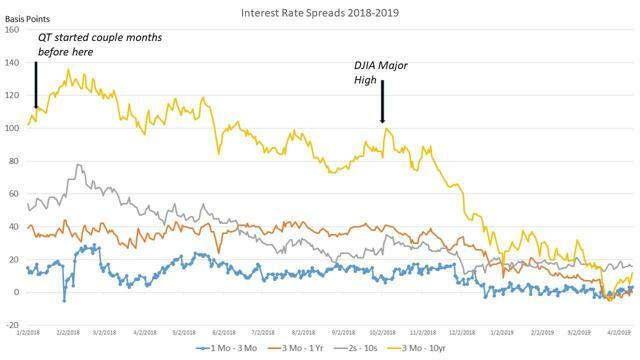 The third chart shows interest rate spreads from the start of 2018 with an additional one not displayed earlier, the 1-month and 3-month TBills (1M/3M). The 1M/3M spread caught my attention by how remarkably free of volatility, at least visually, it's been for most of the duration of this chart. 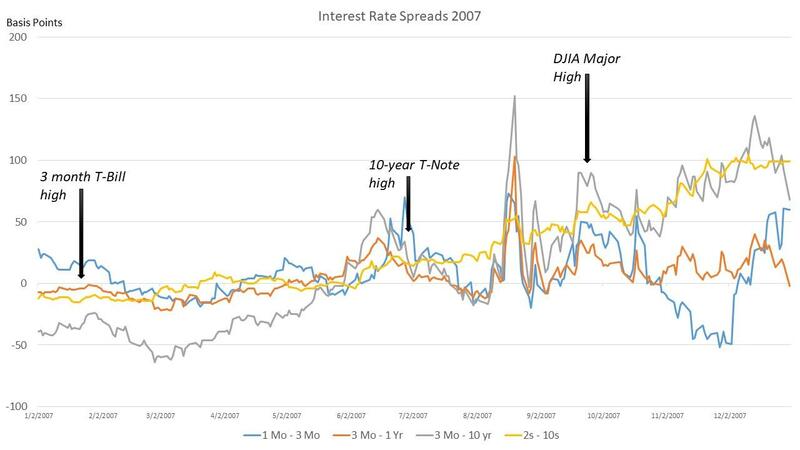 This spread did not exhibit this behavior in 2006, 2007 or 2008. What can the spread tell us? Is something different this time? I'm not suggesting the 1M/3M spread is a recession predictor. Curiously though, the 3M/10Y spread has been narrowing considerably since the beginning of 2018. Two of the other spreads (2s/10s, 3M/1Y) are also narrowing, though more gently. The yield curve is also becoming more flat and, as noted in the opening, went negative last month. This is reasonable evidence of the market anticipating an economic slowdown. The 1M/3M spread does reveal something potentially as important. Its staggering lack of volatility compared to the period before the last recession suggests complacency. There's another metric to support this conclusion. The Merrill Lynch Option Volatility (MOVE) Index is a measure of implied volatility for short-term Treasuries. Consider the MOVE analogous to the VIX for stocks. The MOVE registered its lowest value in the 31-year history of data on March 20, 2019. When volatility is this low, it's a harbinger for greater volatility ahead. Rates are still low by historical measures. All interest rate pairs illustrated are narrowing, and one of them (3M/10Y) has inverted. Another short-term pair (1M/3M) exhibits very low volatility. Complacency in the treasury market is at historic levels. It's a strange dynamic - the market is speaking, but its words are not being heard. My sense is the interest rate pairs will continue to narrow, and there will be further inversion of the yield curve. The economy is softening, which will place stress on weak debtors and their creditors. Debt defaults, anticipated in the high-yield bond market given relaxed credit standards, will push yields higher. Student and auto debt represent potential energy in the next credit crisis. 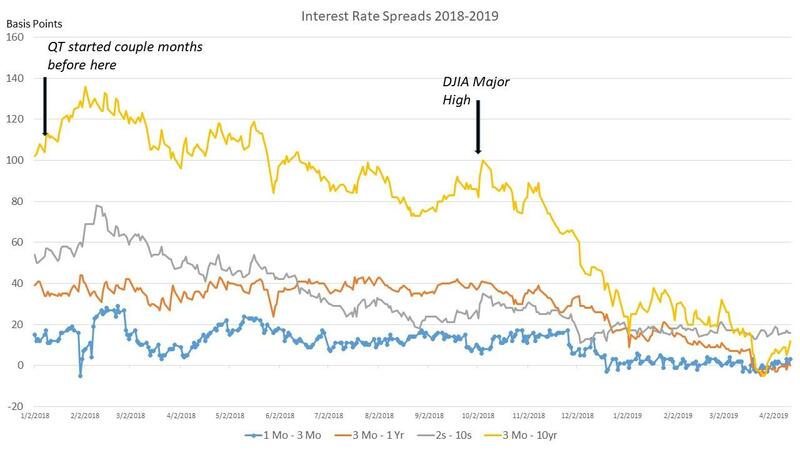 Given the halcyon attitudes and the complacency it breeds, and the major lows in the interest rate markets established in 2016, we are poised for higher rates at longer maturities. 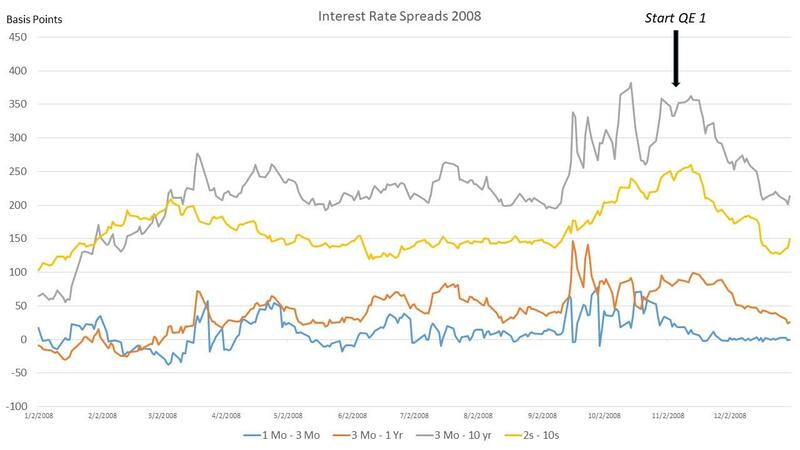 Interest rate spreads will narrow and then widen. To those who argue the Fed Wizards will simply invoke QE 4, I can only say that effort would have to exceed what they did in rounds 1 through 3. Politically (yes, this is part of the calculus), it will be very difficult, if not impossible, for the Wizards to intervene in the same manner that they did previously. The next bailout will be for Main Street, not Wall Street. Prepare for more discussion about Modern Monetary Theory (MMT) and the government's attempt to inject life into a moribund economy. The interest rate markets should entertain in the year ahead. Additional disclosure: I am an investor in short-term U.S. treasuries.